I am a freelance journalist specializing in writing, editing and photography in boating and travel publications. I write for a dozen boating magazines and websites and a growing list of travel publications. I’ve spent the past twelve years combining my passions which include seeing the world, sailing the oceans and sharing my experiences through the written word. I spent my early years in the corporate world in both client-side and agency marketing and I continue to offer marketing communications services and collateral creation including general copywriting, newsletters, brochures, web content, press releases and event content. I was born in the Czech Republic and lived in Egypt, Austria, France and the U.S. before I was 20 years old. These beginnings gave me a fine sense of wanderlust. So far, I’ve managed to touch the shores of all seven continents and have visited 40 countries and counting. 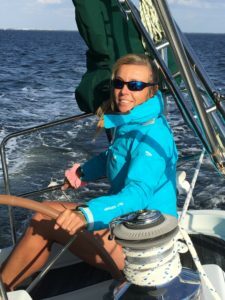 Post-graduate school at UCLA in Los Angeles, I fell in love with sailing which gave me a new way to travel. It took a decade of dedicated time on the water but I earned my USCG 100 Master license and took up running boats for groups of boaters, experienced and novice alike.